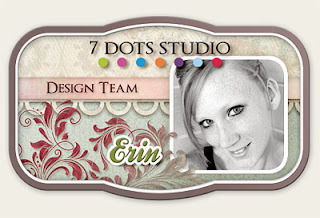 Erin Blegen: My Scrap Cabin: Lindy's Stamp Gang/7 Dots Studio Blog Hop! Welcome to the Lindy's Stamp Gang & 7 Dots Studio Creative hop! We are so excited to have two amazing companies team up for a full day of creativity. This hop will surely get your creative juices flowing so head on over to all these incredibly talented crafters to check out how they've combined the beautiful lines by 7 Dots Studio with Lindy's Stamp Gang products, it's a match made in color heaven! We have a little surprise for you! We would love for you to show some love to all our crafters and leave them a little message. You will have the opportunity to win a fabulous prize by both 7 Dots Studio and Lindy's Stamp Gang so please let us know that you have done so by coming back to 7 Dots Studio and Lindy's Stamp Gang blog at the end of the hop. Here is a full list if you get lost along the way Have Fun! Before you head on your way, I'd like to share with you a layout that I created using 7 Dots Studio and Lindy's Stamp Gang products! Wow, this is stunning, gorgeous papers, flowers, and so much yummy color. Love love the cutout in the page, it looks so dimensional. OH My!!! All I can say is STUNNING!!! Fabulous page .. and so my fave colors! Love the addition of the red and purple! Beautiful layout Erin! I love that you captured the rustic feel of the porch in the layout but yet added some color for a great balance and eye capturing layout! Really great colors -- living on a farm myself, I love the rustic feel you created. Wow! So pretty and earthy! I really love it! What an amazing lay-out! I love all the dimension and clustering! A beautiful page, the colors of the picture come out in every way! This looks beautiful, Erin! The flowers and mists are so pretty. Gorgeous! Love all those flowers! Just fabulous. I really like your style. Beautiful layout! I love the rustic colored flowers with a pop of color added. Erin, this is stunning! So rustic and what a great feel of a dusty summer in the dead of winter. Love the torn paper curlicue! This is stunning Erin and I didn't know Lindy's had embossing powder, however I loooooove their mists. Erin I have to admit I am in awe of you! There is nothing you can't do. I read your blog daily and am amazed by everything you do. Your layout is gorgeous! I truly wish you and yours all the very best this holiday season may it be filled with peace and joy. wonderful layout - great job! Gorgeous layout as always. Just love your photo and those gorgeous lower clusters. You can never have too many flowers:-) love the flower clusters! Erin ... wowser, wowser, wowser ... this is seriously amazing. Absolutely gorgeous, as per Erin's style! Love your work! wow absolutely fabulous, love all of it and love 7 dots papers. First of all, I am jealous. I want your back porch as I simply love it. Secondly, this layout out is fabulous. I love they way you incorporated everything together. I may have to scraplift this. Thank you for sharing! Also, I just started following you in Pinterest- awesome! Love this background and the paper matching your photo. This back porch so reminds me of my front porch when I live in Indiana many moons ago. So lovely! You are so blessed to live in such beautiful surroundings. Love this layout! Soft and beautiful LO.... Love the chipboard and the flowers too! This is just beautiful! Love the strip going down the page and the flowers....draws your eyes to the cabin! Fabulous! Love the colors. The distressing on the ends of the paper is great. The flowers really make the page pop. Stunning page, dear Erin! I visited your blog a several times and your LOs are always beautiful!